The USS Wilkes-Barre, or the Willie Bee, is the go-to Key West dive site if you have technical scuba diving certification. The Willie Bee is a Key West dive site that is reserved for those with the highest level of scuba diving certification. This 610' long Cleveland-class light cruiser with a 63' beam, was built in 1942. The Willie Bee served at the very end of WW II in the Pacific, and eventually played a vital role in the battle of Iwo Jima and the invasion of Okinawa. After the war, the Wilkes-Barre served for three more years and received 4 battle stars before being decommissioned in 1947. After sitting in reserve in Philadelphia for 25 years, the Navy decided to use her to test explosive ordnance. In doing so, the Willie Bee was split into two sections and on May 12, 1972 the stern sank. On May 13, after additional explosives were employed, they managed to scuttle the bow. The stern of this massive ship is at a depth of 250 feet in an east - west upright position. Her superstructure can be reached at a depth of 145 feet. The bow sits about 100 yards to the east on it's starboard side, at a depth of 200 to 250 feet. 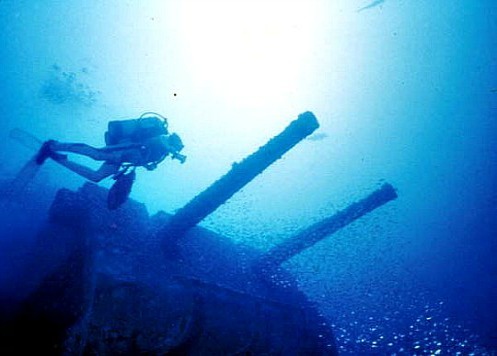 When scuba diving Key West, anyone wreck diving here usually checks out the stern first. This is due to it's upright position and the fact that the ship retains much of it's original equipment. Diving into the wreck you'll encounter radar, monitors, phones and various other paraphernalia. It's also surprising to discover that some of the portholes still retain their glass, since some of her railings and cables are severely twisted from the explosion. Due to it's massive size and deep location, this ship is also referred to as the Lethal Lady. All portions of her are positioned below the depth allowed for recreational diving, and so her nickname is not in jest. Due to the depth and the distance separating the stern and bow, each section is considered to be a separate Key West dive trip. The depth of this ship also means that divers will be treated to some of the more unusual and larger marine life. Sperm whales, the seldom seen whale shark, a greater variety of shark species, swordfish, large goliath grouper and black grouper, scamp, amberjack, speckled hind, sailfish and marlin, manta rays, barracuda, margate, bonito, and snapper inhabit these greater depths. You'll also notice that sections of the ship are heavily encrusted with oysters, and other marine life. Since this is such a deep Key West dive, bottom time is usually limited to about 25 minutes with a decompression time of about 60. This is why anyone diving in Key West will return to this wreck on a periodic basis. There's so much to see, and just not enough time to do it all at once. Knowing that there's quite a bit of area to cover, it's advisable to have studied the lay of the land before hand. A good replica model, books with accurate depictions of the wreck diving site, or going with a local guide will help make the most of your down time. Going with any of the Key West dive charters will guide you to the hot spots quicker. They'll also have the extra, essential equipment you'll need for diving into the wreck. Also, there are no markers or mooring buoys at this Key West scuba diving spot, so a guide from any of the Key West dive shops will know the best spot to throw down the anchor. The Wilkes-Barre proudly served her country when waging the battles she entered. She passes that tradition of courage and endurance to those diving in Key West, who are brave enough to go wreck diving into her dark, mysterious depths.